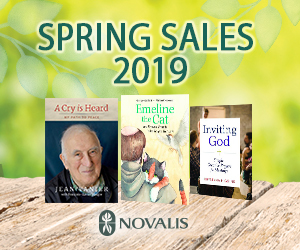 Perspectives Daily - The Easter Triduum Begins. The Triduum liturgies for Holy week has officially started today as Pope Francis on presided over the Chrism Mass in Rome this morning. In his homily, the Pope spoke about the Joy of the Gospel. He explored 3 icons of THE good news: the stone water jars at the wedding of Cana, the jug that the Samaritan woman carried on her head, and the fathomless vessel of the Lord’s pierced Heart. 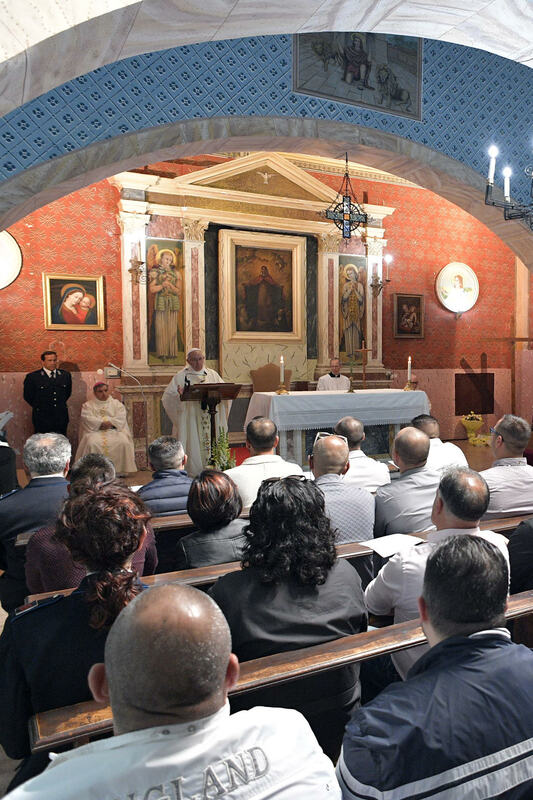 Later in the day, the Pope traveled to Paliano prison, a maximum-security facility for ex-mafia members where he celebrated Mass for the prisoners and washed the feet of inmates as a gesture of humility and service. 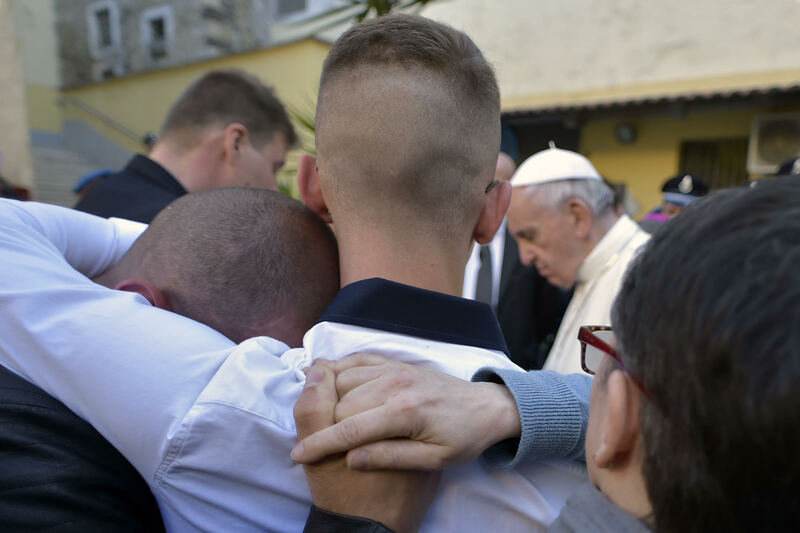 In his off-the-cuff homily Pope Francis invited those present – and all Christians - to serve the other. "The disciples, the Pope said, used to argue about who was the most important amongst them". “He who feels or thinks he is important, he continued, must become small and be a servant to the others. That is what God – who loves us as we are – does every day”. 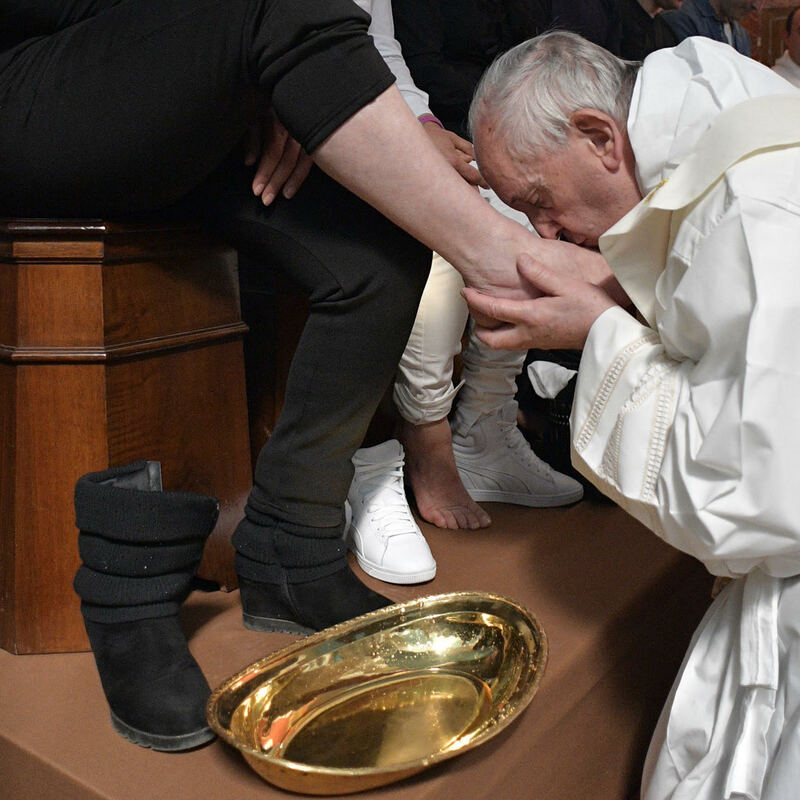 The center hosts some 70 inmates, and amongst those whose feet the Pope washed, there are 10 Italians, 1 Argentinean and 1 Albanian. Amongst them 3 are women and 1 is a Muslim who will receive the Sacrament of Baptism in the coming month of June. The Paliano detention center is the only such institute in Italy reserved in particular for former members of criminal gangs who collaborate with police and the judiciary. Baptism during the celebration concelebrating Mass with the other cardinals and bishops. Now during this time Salt and Light TV will bring you full coverage of the Holy Week and Easter services. Here are some of the details. Here in Ottawa, Communion and Liberation is organizing a Way of the Cross tomorrow, led by Bishop Terrence Prendergast, the Archbishop of Ottawa, through the streets of downtown Ottawa. During the procession, participants will make five stops at some of Ottawa’s main religious and cultural locations, including the Supreme Court, Parliament, and Notre Dame Cathedral. Departure is at 9:30 am tomorrow from Saint Patrick’s Basilica and all are welcome to come along. If you love watching Salt and Light TV but have some ideas for us, you’ll be happy to know that Salt + Light is conducting a national survey that gives our viewers a chance to let us know your thoughts about Salt And Light. This is a chance to send us your feedback and let us know what you like and where we can improve. The survey is completely anonymous and can be easily accessed online. You can access the survey on our website at saltandlighttv.org/springsurvey2017. Thank you for your participation. We will use your feedback to help us plan for improvements in our programs and shows this upcoming year. And finally tonight. We end this week with a look at the Paschal Candle. You’ve seen them used at the Church during special occasions, and every Easter, a new Paschal candle is blessed, lit then used throughout the Paschal season and through the year. And that.. is all that we have time for today. Join us again next Monday where we bring you more of the LATEST News and Stories through the Perspectives of a catholic lens. From all of us here at the Salt and Light studios, we wish you all the best this Easter season.